OAHU, HAWAI -- Mixing and dilution of effluents discharged into the ocean is an important aspect of health of ocean users and the ecology of the denizens. 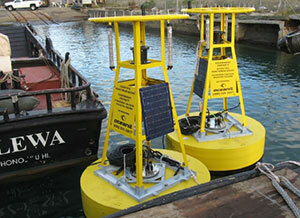 In an effort to monitor the path of wastewater making its way in to the Pacific water off of Oahu, the EMM2000 Buoy has been selected as a measuring tool for the discharge of pipe effluent (sewage water) 800 ft off shore to ensure that the wastewater discharge was in fact moving away from shore to avoid affecting local beaches. With the use of temperature nodes within Thermistor strings, water columns were measured to detect the quality of the water along with downward-looking SonTek Acoustic Doppler Profilers (ADP’S) used to check the water’s current profile. 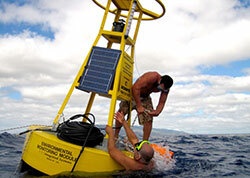 The Oceanit Center in Honolulu was selected to lead this project. According to Technical Director, Dayananda Vithanage, the group will investigate a wastewater outfall extension from 200 ft to 300 ft depth on the south shore of Oahu. The deeper of the two locations is west of the entrance to Peal Harbor. The maximum currents in the area are expected to be about 2 knots and summer swells can be as high as 3 meters. Custom fabricated Stainless Steel frame to hold Acoustic Doppler Profiler in a downward looking position. 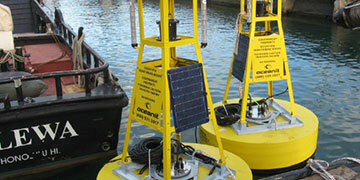 Thank you to Oceanit for providing us photos and additional information on this project. Visit www.oceanit. com for more information on this study and other services provided.